On February 28th 2012 over 100,000,000 Indian workers will come out on strike. Home/What's new/On February 28th 2012 over 100,000,000 Indian workers will come out on strike. On February 28th 2012 over 100,000,000 Indian workers will come out on strike. Workers from many unions and sectors are trying to gain improvements in areas such as, pay, pensions, and employment rights. The strike has been called because workers have said ‘enough is enough’, after two years of the government refusing to negotiate with unions on any issue. Indian’s are sick of the rich getting richer, record economic growth, whilst 400 million people have not got a pot to piss in. On February 28th 2012, an estimated one hundred million Indian workers will all walk out of work for twenty four hours in what is likely to be the biggest strike in world history. 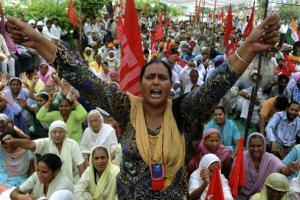 Over a dozen of India’s largest trade unions have called for and signed up to the strike. The strike will affect many sectors, including public sector banks, ports and docks, railways, insurance, road transport, energy workers, miners, and aviation workers. The different unions have a variety of different demands, they include gaining the same rights and protection for temporary and contract workers that permanent workers have, raising and extending the minimum wage, resisting the attacks on trade unions, stopping price rises, the creation of a national social security fund, increase in pensions, and combatting corruption. Despite seeing growth of around 9% each year, more than four hundred million Indians live in absolute poverty. Only a handful of countries enjoy similar growth, yet Indian workers have not even been flicked so much as a crumb from the bosses table. Working and living conditions are equal to, and actually worse than some African countries that are not experiencing the same economic growth. Indian workers are starting to switch on to the fact that they ‘system’ only serves the wealthy and the bosses. The last few year has seen a dramatic rise in the number off millionaires and billionaires, yet jobs are lost, wages cut, and unions rights pushed back. India’s richest fifty five people have 1/6th of all the country’s wealth.